This example demonstrates how you can use PROC SPP to explore a multitype point pattern. Consider the following data set, which consists of locations of retinal amacrine cells in a rabbit’s eye. The data set contains three variables: X and Y are the coordinates of the cell locations, and Type is the type of each cell (which is based on whether it turns on or off when exposed to light). The data were originally analyzed by Diggle, Eglen, and Troy (2006) and Hughes (1985). Output 105.1.1 shows two types of cells that are characterized by their state as on (in red) and off (in blue). Output 105.1.2 lists exploratory information for the amacrine point pattern, and identifies it as a marked point pattern. Output 105.1.3 shows the information for each mark type, including the frequency, percentage in the data set, and the first-order intensity, which measures the number of events of that particular mark type per unit of area that is contained in the marked point pattern. 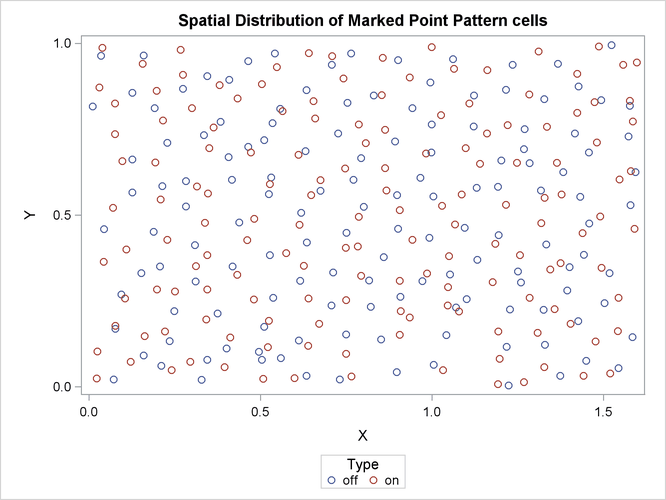 Output 105.1.4 shows the cross-K-function test to detect a clustering of points for which Type=off around points for which Type=on and vice versa. 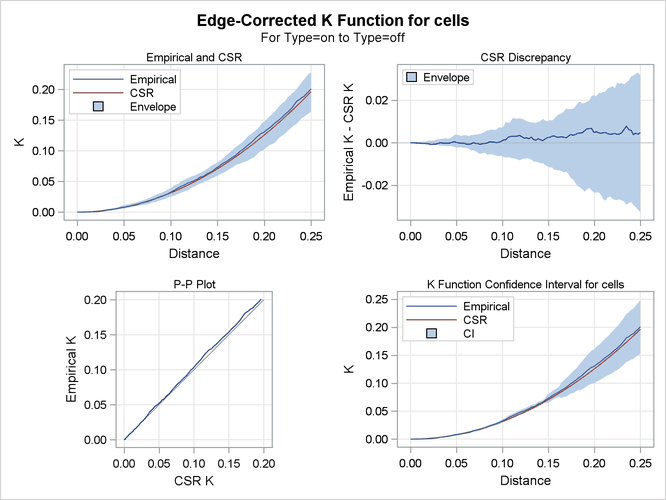 It is very clear from the plots in the top left corner and top right corner that there is no significant difference between the computed cross-K function and the theoretical cross-K function. This clearly indicates that there is no significant clustering of on amacrine cells around off amacrine cells.